The Tuesday Throwdown Challenge is to use Rainbow Colors. 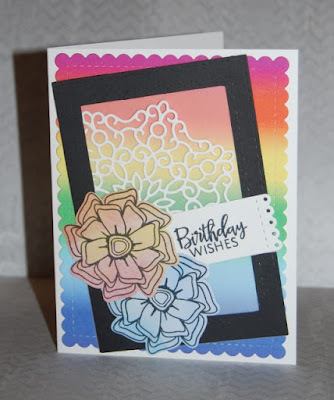 Actually, I just finished a rainbow card using paint chips and was pleased with the outcome. However, it is for a future DT post and must remain a surprise until then. Such a pretty card, Christine! Love that rainbow backgorund and your sweetly shaded flowers. Your rainbow background is lovely, Christine! Thank you for playing with us at the Simon Says Stamp Wednesday challenge! Viva La Verve: Happy Graduation, Gentlemen!